You may be surprised to see me providing long-form TV previews in a month other than August or September, but I have two retorts for that. 2. The TV landscape is different now that when I started writing Fall TV Preview posts back in 2004. Now instead of one big monolithic season, there are, as Dean recognizes here and as Entertainment Weekly also recognizes in its current issue, a second or even a third season after the big launch in September. But enough from me. Go for it Dean. Did you enjoy Lord of the Rings? Well this is not that kind of fantasy. This is HBO fantasy. You know that character you like? He died while you were reading this. There was probably a naked woman there too. This show contains ADULT THEMES. Oh, and the books are great. You should totally read the books. Sample plot summary: Jon finds himself in a perilous situation. Tyrion says something that gets him in trouble. Joffrey kills a baby. I don’t want to freak you out, but I think I might be the voice of my generation. This show got tons of critical praise, and then there was a great big backlash against it. I think a lot of the backlash was misplaced and unfair. This is a really good show that nicely subverted my expectations quite a few times. It won’t be everyone’s cup of tea, but you should give it a whirl. Sample plot summary: Hannah must find a job. Marnie is annoying again. Adam does something unexpected. This show is nominally about the two teenage sons of a former boy adventurer, turned super scientist. What this show is really about is disappointment and failure. It’s also really, really funny. Sample plot summary: Dean and Hank go on a double date. The Monarch must choose between killing Doctor Venture or saving his relationship with Doctor Girlfriend. Set in the magical land of Ooo (which may or may not be Earth after a terrible event destroyed life as we know it), Finn, the only known human, and his magical dog Jake go on adventures and maybe learn something about what it means to grow up and also it’s hilarious. Sample plot summary: Finn must retrieve a Frisbee from a tree. Jake makes pancakes. "Not exactly," said the Medical Man. "There are balloons." Do you like Syfy original series? Interested in time travel? If so you’ll probably be giving this a shot, right? Do you hate that Syfy spells its name like this now? I do too. Sample plot summary: What do you want from me? I can’t travel through time to watch this show to give you a synopsis. A ghost, a vampire, and a werewolf all live together in a house. AKA: easiest show to green-light ever. Sample plot summary: Ok, this was a bad idea to do this bit. I haven’t seen this show, so maybe the werewolf and the ghost date and then the vampire gets all sulky about it? That sounds like something that could happen. 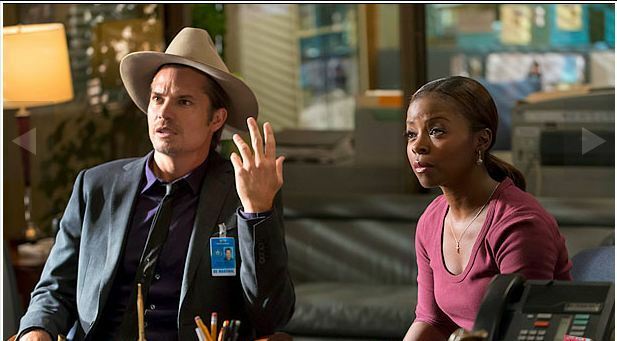 Sample plot summary: Raylan is under investigation for shooting a criminal. Boyd makes a conversion, but is it sincere? Art is grumpy. A blog is like a diary but you want everybody to read it, like if you get bad service at a restaurant you blog it and then you get a free meal at that restaurant but then you wonder did they just lure me back here so they could just spit in my food so then you blog that and then they take you to court. Look, I know the name is bad. But you liked Scrubs right? This show is made by the same guy that made Scrubs. It’s just as funny, the cast has great chemistry, and you are really missing out if you’re not watching it (Which you probably aren’t, because it’s on TBS now because you weren’t watching it in the first place). Just give it a chance and you will not be disappointed, I promise you that. (Also I’m sad this bumps up against Justified, because this is my 2nd most anticipated return). Sample plot summary: Jules and everyone else drinks wine. Travis doesn’t because he is too young. Keri Russell and some guy I’ve never heard of are Russian spies living in America in the 1980s. Remember when that attractive redheaded woman was caught spying on the U.S. a few years ago? She was sending them back newspapers and other readily available information. Russian spy quality has really gone downhill these days. That’s how you get ants. So FX is just transplanting Australian comics into America now. First that Australian who plays Wilfred with the rage issues, and now they’ve brought in this other bloke to try to take jobs that should go to God-fearing American comics. Sample plot summary: Yes, plot summaries were a mistake. I see that now. Sample plot summary: A sketch is done about putting birds on things. The Mayor of Portland needs a favor. This show is on a Friday and is on Cinemax. I just included it so now I don’t have to leave Friday blank. Sorry Cinemax, this is the amount of effort I put into your shows. I did hear Strike Back was good though. Sample plot summary: Adult situations happen. Cinemax! The power of stripes compels you!